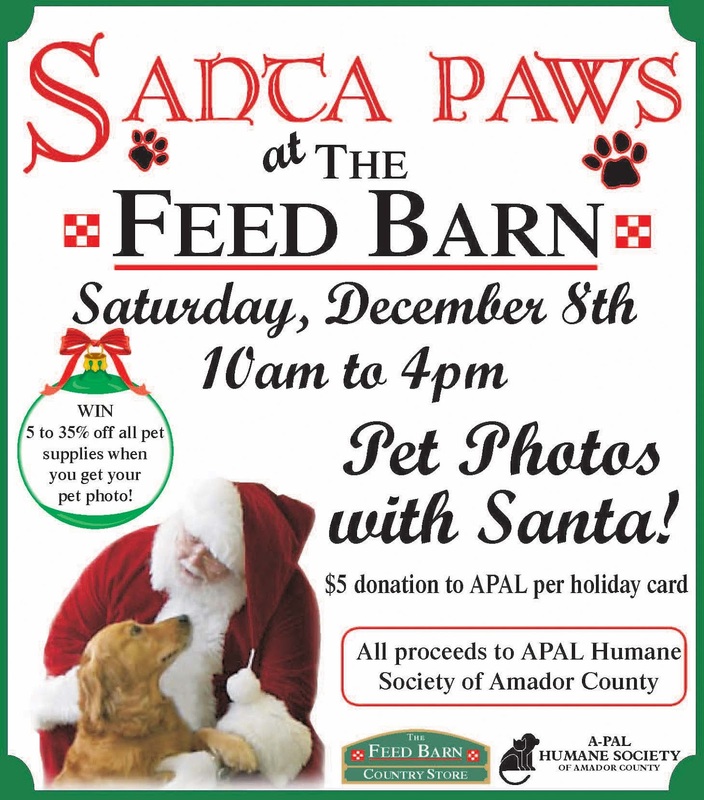 Hello to the citizens of Amador County! Do you or a friend have 2 hours a month to be a docent at the Sutter Creek Visitor Center or the Monteverde Store Museum? it is fun and you get to meet people from all over the world. No experience is necessary, just a love of the county you live in. We are in need of people to volunteer to keep the doors open for our visitors who need information or want to see the inside of the Museum as part of our history. We have lots of wonderful brochures and maps to hand out that will answer almost any question someone may have, so no worries that you may not know enough about the history, shopping, restaurants, wine tasting, activities, and all the wonderful things that Amador County has to offer the visitors. There is no set schedule, so you can come in as little or as often as you like. We would greatly appreciate any time you can spare. FREE all you can eat traditional Thanksgiving dinner! Gifts, clothing, children's events. Sponsored by the Amador American Legion, Community Hope and Calvary Chapel. Pine Grove Youth Conservation Camp held a fundraiser to raise funds for a local non-profit agency called Amador Stars. The guys were very eager to support this great cause! Amador Stars which stands for Support, Transportation, and Resource Services is a vital part of the support system for cancer patients in Amador County. They have numerous volunteers that donate countless hours to this organization making it possible for them to provide assistance to many cancer patients throughout Amador County. Chemotherapy patients are able to get advice on where to buy wigs, and how to take care of them. STARS offers free wigs to those in need as well as scarves and head wraps. STARS also oversees providing free transportation to cancer patients that need rides to their chemotherapy and radiation treatments. They transport patients to Sacramento, Stockton, Lodi and throughout Amador County to attend these appointments. All money raised by STARS stays in AmadorCounty for local cancer needs, except for a small portion that is donated to cancer research. 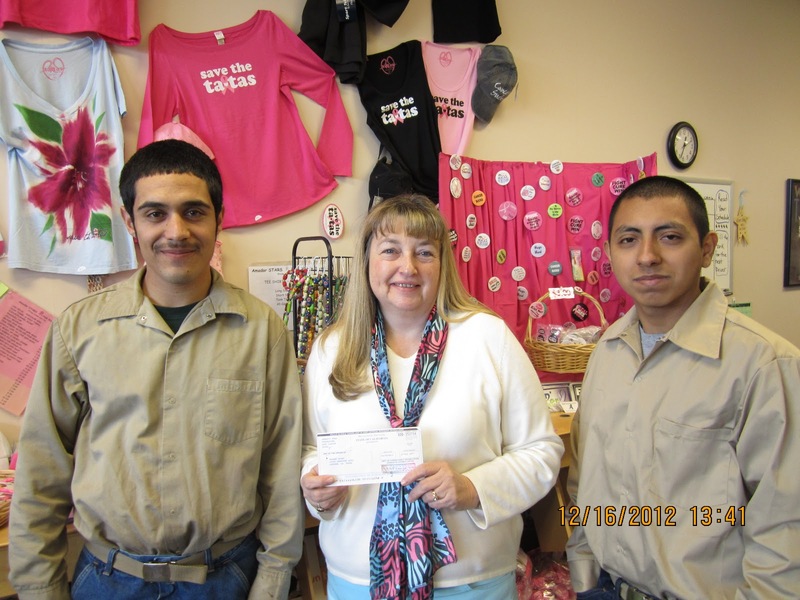 Today, PA 1 Brady and firefighters Trevino and Chavez delivered a check for $430.00 to this organization. They were very grateful for our thoughtfulness, and said our donation would help many people. Pine Grove Camp has also provided community service to STARS by cleaning the local fairgrounds after the big walk to fight cancer each year, one of their major fundraising events. Happy Fall, everyone… we hope you are all enjoying the cooler weather! We have some information and workshops that we would like to share with you. Please feel free to forward, share, post, and distribute, to help us spread the word. Please see attached flyers, as well. Let us know if you would like more copies of any of these flyers, and we will be happy to get some to you. Come and join us for an exciting evening of hands-on experiences on the most effective ways of cleaning your home and child care facility. Parents are looking for high-quality child care… a clean facility increases the quality of care that you provide, and helps to promote your program to parents. In addition to learning the most effective cleaning methods, participants will get the opportunity to see the Fight BAC! Handwash Education System from Glo-Germ, in action! Just because you’ve washed your hands, doesn’t necessarily mean that your hands are clean! “See” how germs are still left on your hands, using Glo-Germ’s special UV Light. Are you a grandparent raising a grandchild? This program can help you with Respite Child Care. 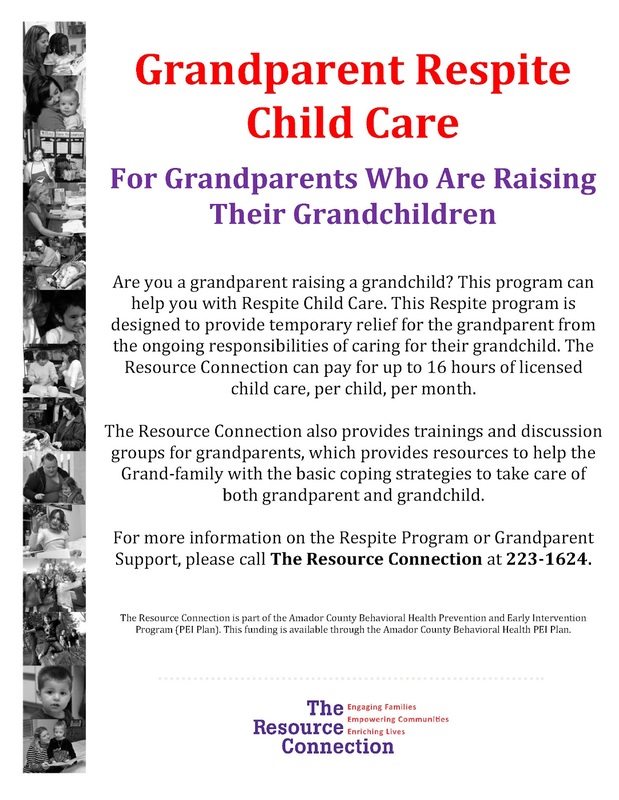 This Respite program is designed to provide temporary relief for the grandparent from the ongoing responsibilities of caring for their grandchild. The Resource Connection can pay for up to 16 hours of licensed child care, per child, per month. The Resource Connection also provides trainings and discussion groups for grandparents, which provides resources to help the Grand-family with the basic coping strategies to take care of both grandparent and grandchild. 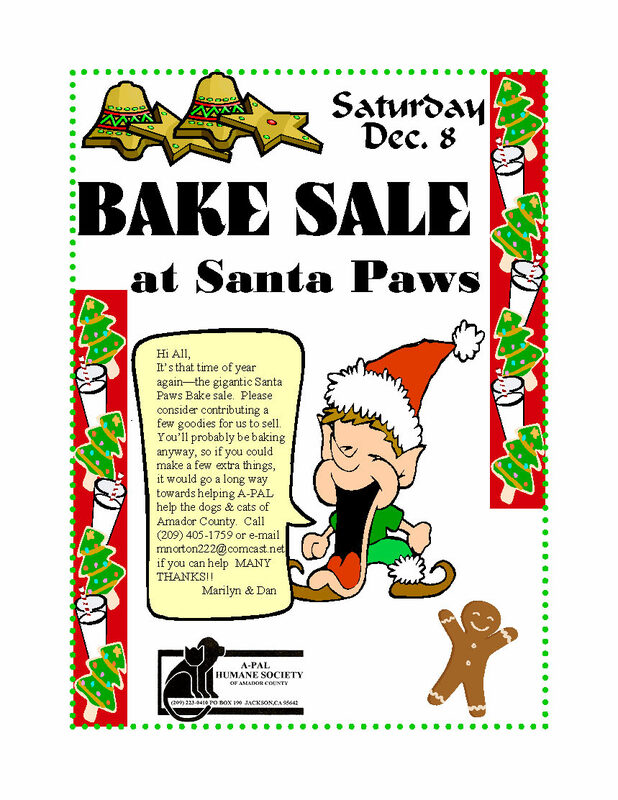 Please see the new, updated version of this flyer, attached. Just a reminder about our popular Toddler Playgroups! 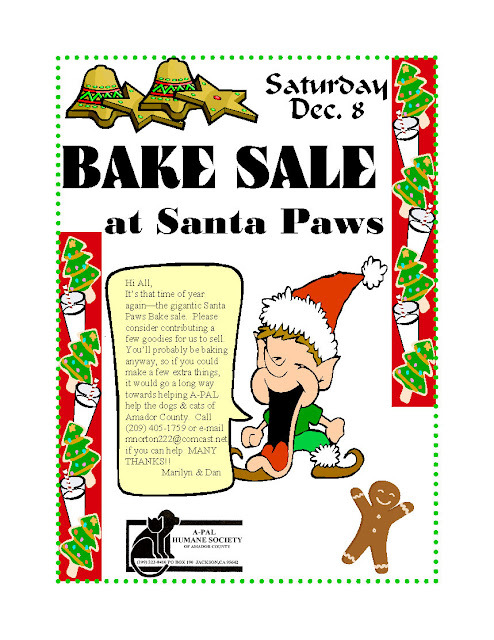 Free to children ages 0-5 and their Mom, Dad, Grandparent, Or Caregiver. 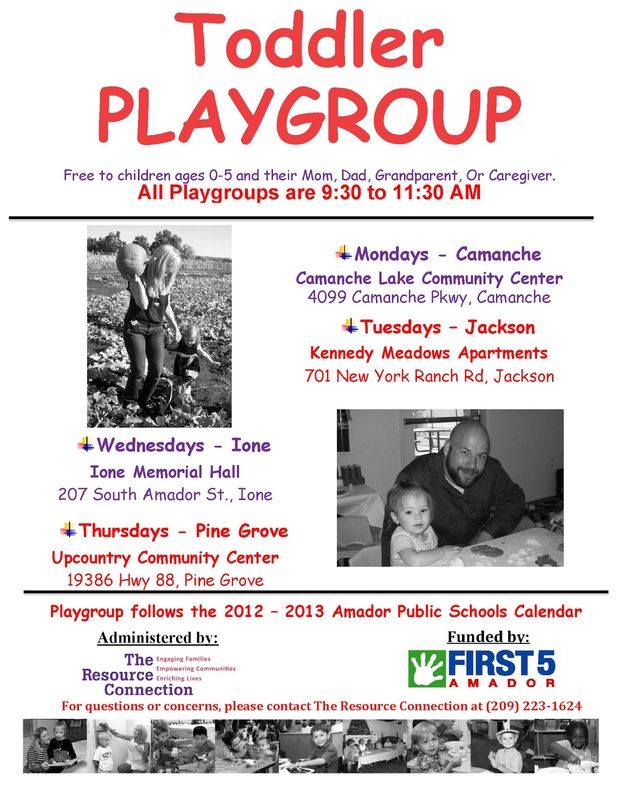 All Playgroups are 9:30 to 11:30 am, and follows the 2012 – 2013 Amador County Public Schools Calendar. 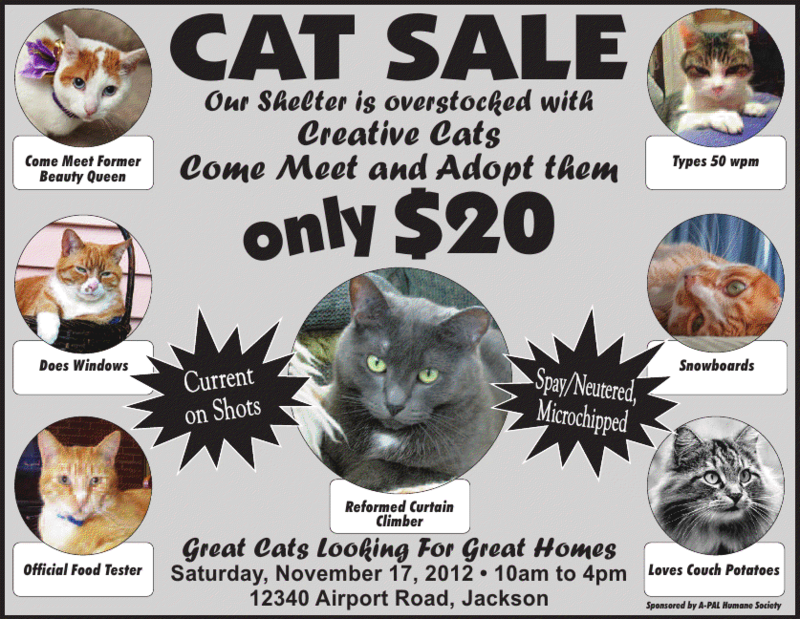 Located at a different location throughout the county, Monday through Thursday. 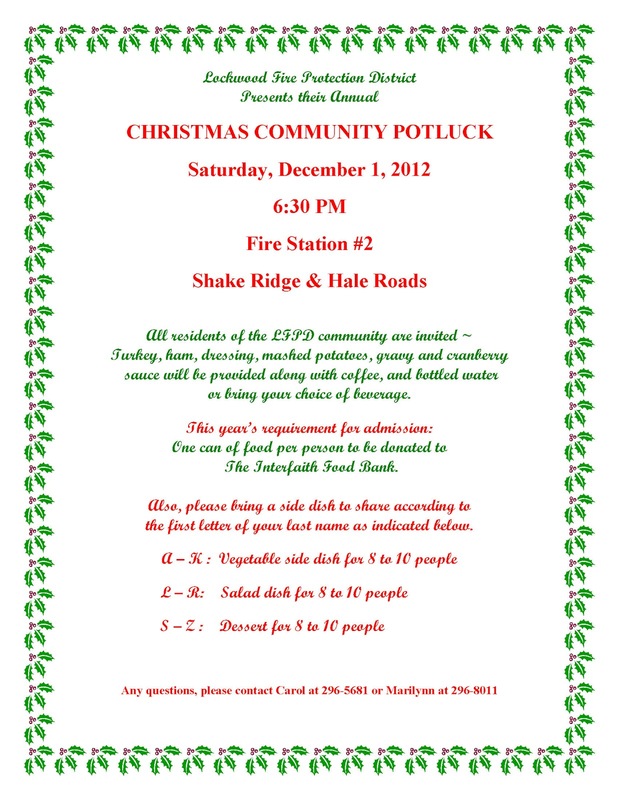 Please see attached flyer. For those of you who missed the August class, we will be repeating the Fruit Tree Pruning Clinic: Sataurday, November 17, 2012 @ 10AM @ the Senior Center in Jackson, 229 New York Ranch Road. The fruit trees are located around in back of the building. This is a free class – open to the public. Receive instruction, hands-on experience, and answers to your questions. If you have them, bring pruning shears and loppers. If not, we’ll have extras. Based on extensive research, the UC Cooperative Extension now recommends fruit tree pruning in the late summer and fall. This allows you to train young trees, maintain tree height, and improve the availability of light for lower fruiting wood. Master Gardeners are available from 10am until 12 pm Tuesday through Thursday at the Ag Building, 12200-B Airport Road, Jackson, CA. Phone with message machine: 223-6857. Website: cecentralsierra.ucanr.edu, click on Master Gardeners/Home Gardening and select Amador County. Help the little horse, Spark! My name is Cam Marker. Stefanie Hogan suggested I contact you to further spread the information surrounding the little horse Spark, that was found abandoned on Michigan Bar Rd. A few weeks ago. The Dispatch did an article and people want to donate. A-Pal has set aside a fund for Spark, so if people want, they can specify Spark on the donation and send it to A-pal, P. O. 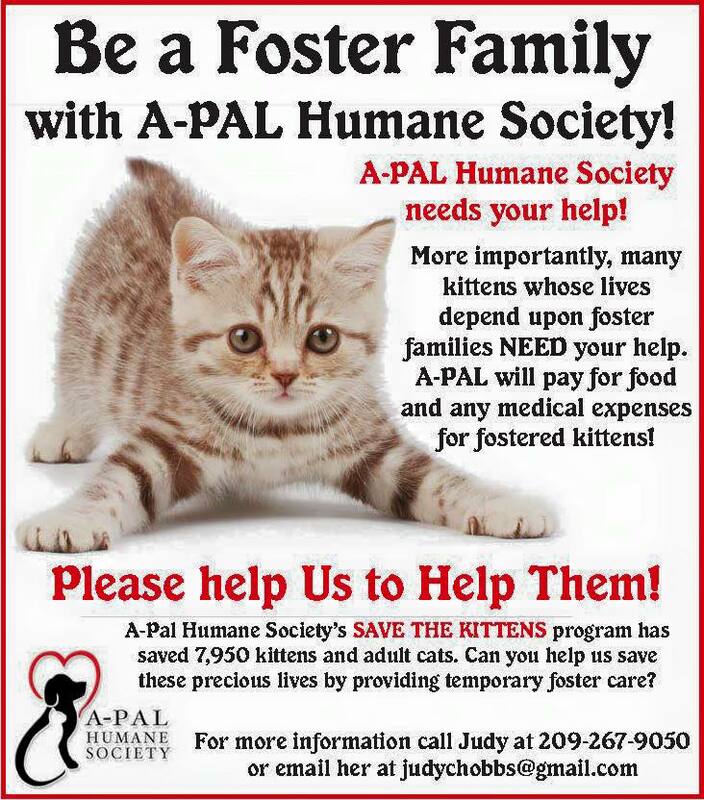 Box 190, Jackson, CA 95642 or call 223-0410 for more info. Could you put this info on your site?